(CNN) -- Unlike television crime shows in which machines can instantly spit out results, toxicology testing to determine what drugs are in a person's body can be a long and painstaking process. 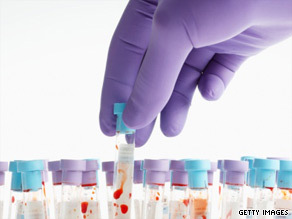 For toxicology screenings, blood samples are drawn from the leg and heart, as drugs can circulate around the body. The Los Angeles County coroner's office estimates that toxicology tests on the body of Michael Jackson could take six to eight weeks. The results are needed to determine the singer's cause of death, a spokesman for the coroner said. The singer's autopsy last week was inconclusive, although officials said there were no indications of external trauma or foul play. Identifying drugs in the human body requires a lengthy sequence of tests and confirmations that can take weeks and even months, forensic experts said. It's not as if "you go and buy a pregnancy test and drop urine on it, " said Dr. Yale Caplan, the former chief toxicologist for the state of Maryland, who is now a consultant for federal agencies. "Forensic testing is much, much more complicated. Questions about the possible role of prescription medications in Jackson's death have swirled since Thursday, when the singer was found unconscious. Edward Chernoff, attorney for Dr. Conrad Murray, who tried to revive Jackson at the singer's rented home, said the doctor was not aware of any prescription drug abuse by Jackson. "I think those are just rumors," Chernoff told CNN's "American Morning." "When toxicology comes back ... that's going to be all cleared up." The medical examiner determines whether a toxicology test is required. The testing becomes more exhaustive in cases of a suspected drug death or one in which the cause of death is unclear. Saturday and Sunday night, CNN's Don Lemon takes an in-depth look at Michael Jackson's life and legacy. His childhood, his music, his finances, his influence. Don't miss this CNN Presents special. This weekend at 8 p.m. ET. "What is routinely done? In the case of celebrity deaths, probably a lot," said William Anderson, chief toxicologist for the Washoe County Sheriff's Office, in Reno, Nevada. Anderson was a graduate student at the toxicology lab in 1977 in Memphis, Tennessee, when singer Elvis Presley died. While Anderson was not involved in testing Presley's samples, he was frequently in the laboratory. Presley's death was ruled the result of an irregular heartbeat, and his autopsy report was sealed amid accusations that abuse of prescription drugs caused the problem. Anderson said that the process seemed thorough and that specimens went to multiple labs for confirmation. In standard screening, blood samples are drawn from various areas of the body, including the leg and heart, because drugs and poisons can circulate, toxicologists say. The initial screening test using blood and urine samples indicates what type of drugs -- for example opiates, cocaine or amphetamines -- might be present. "It points you in the right direction," Anderson said. But the results are not conclusive. In order to confirm that a person had a specific type of drug in his or her system, the drug must be extracted from the specimen. More complicated cases could require samples of the liquid in the eye, bile, or tissue from the liver, kidney, stomach or lungs. "The drugs must be physically separated from the biological matrix," Caplan said. "If it's liver or blood, you have to do preparations for the extraction procedure, which is often multistep." This can also take several days, he added. The specimen is mixed with an oil solvent, which attracts the drugs away from blood or tissue sample. Then the solvent is evaporated, leaving the various chemicals. "You have to purify the drugs out of this mix of things, which has lots of other chemicals in it that may interfere," Anderson said. This preparation has to be done for every specimen undergoing analysis. An instrument called a gas chromatograph-mass spectrometer separates the compounds and provides information to enable toxicologists to identify them as specific types of drugs. One positive finding can lead to more tests of different samples, triggering a sequence. "You have to make a series of tests," Anderson said. It "can take a long time to complete the whole battery of tests. If you find something, you go back and quantify it. And you do have a lot of other investigations you're going through at the same time." If a lab worked on only one case, the work could be completed in about a week, Caplan said, but that is not a reality for public labs. While simpler cases are likely to be completed in about two weeks, "it usually takes four to six weeks if they run into unusual things. If unusual drugs are involved, they may have to be referred to a private lab or FBI lab," Caplan said. After receiving the results, toxicologists must analyze the data and verify all the facts and findings "to cover all their bases," said Dr. Roy Altman, a retired forensic toxicologist. "He wants to get all the ducks in a row, run another analysis that will confirm the first positive [finding]," Altman said. "He will do other analyses to make sure everything holds up in court, if it turns into a legal case and he has to testify in court his findings." In sensitive or high-profile cases, the samples probably will be sent to other labs for confirmation, scientists said. "That's really what takes the time," Caplan said. After the lab determines what drugs and poisons were present in a person's body, the medical examiner determines the cause of death, and a death certificate can be issued.